I am a bit of a do-it-yourselfer. When looking for a new service like an online photo gallery, my first instinct is to find an open source package where I can host photos on my own web server. I know that many will skip this step and go directly to Picasa. These days, it seems to come down to those choices: do it yourself, or give another slice of your life to Google. In this post, we’re going to do it ourselves. Ever since the days of the Palm Pilot, I have made heavy use of the calendar application. When I switched to the iphone in 2009, I decided that I wanted to use a online calendar that I could access from my laptop and from the iphone. I looked at the open source world, and I found a package called DavICal, by Andrew McMillan in New Zealand. It uses the CalDAV protocol to exchange event information with clients like the iphone’s calendar, iCal on the Mac, Mozilla Thunderbird with the Lightning plug-in, Mozilla Sunbird, and (I think) Outlook. Setting up the server is pretty well documented on the DavICal web site. On a Debian-based server, it’s a simple “apt-get” operation (after you add their site to your sources list). Below, I will talk about how my calendars are organized, and then I’ll walk through the steps of setting up a new user and calendars on the server, and then setting up the iphone to access these new calendars. 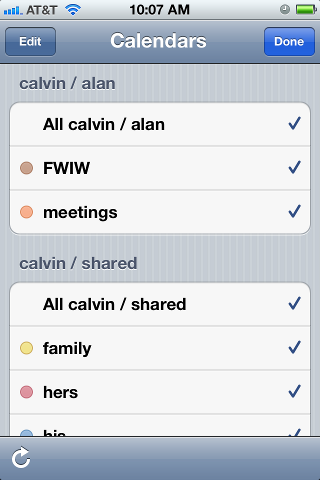 I organized my calendars in two groups, owned by users “alan” and “shared”. The “alan” user owns a set of calendars that I use, but that my family does not care about. The “shared” user is stuff that we all need to see. This might seem a little weird, but it makes things work out well on the iphone. Below is a picture of the iphone’s “calendars” screen, which shows this grouping. Notice the orange calendar called “meetings”. I have meetings at work all day, and my wife really doesn’t need to see them on her ipod, and she does not need to hear the reminders throughout the day. So the meetings calendar is owned by the “alan” user. On the other hand, we all need to know about family events (yellow), “his” stuff (blue) and “her” stuff (red). That stuff is owned by the “shared” user. Below, when we set up the iphone calendar accounts, I will have two accounts (“alan” and “shared”), and my wife will only have one (“shared”). I am sure there are other ways to get the permissions to work out, but this is dead-simple, and it shows the division in the screen shot below. In case you wondered, “calvin” is my server. And “FWIW” stands for “for what it’s worth”… stuff that I want to know about, but that I am not planning on attending. I want to know when Mardi Gras and Burning Man and DefCon are taking place, but I am not going to any of them. We’ll start with the DavICal web interface, which is functional, but not very polished. You need a user account, and that user can own several calendars (called “collections”). To create a user on the DavICal web interface, you need to log in as an administrator and use the menu to “create a principle” of type “person”. See? Precise, carefully worded, but not so user-friendly. The new user can now add calendars by logging into the same web interface and selecting “User Functions” and “List My Details”. That screen shows a bunch of junk you don’t care about at the top. But at the bottom, there is a list of “collections”. That’s the CalDAV term for a calendar. Use the “Create Collection” button to make one or more calendars. Make sure to give them a “display name”. That’s the name that will show up in the iphone’s calendar list. When you hit “next”, it may pop up a box complaining about SSL certificates. In my case, I don’t have proper SSL certificates, so we’re going to just say “continue”. Setting up SSL on the server is a future blog post. So we’ll say “continue”. At this point, you wait… and wait… for the iphone to guess all of the rest of the settings it can think of. It will finally finish, and you’ll have to again tell it “don’t use SSL”. But surprisingly, it should have figured out the rest of the settings. At that point, when you open the iphone’s calendar application, your server should show up in the calendar list, with all of the individual calendar names below it.